Many year ago I had to sell my set of record players, and ever since I have been on the hunt for a replacement! Moving and building work to our house has meant that my vinyl collection had been packed away and covered in dust. At last our house is looking less and less like a building site and I have put up shelfs just to house my much loved vinyl! 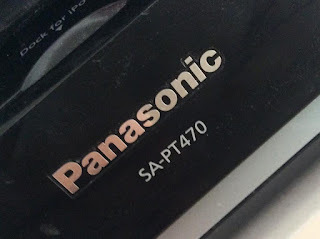 My love of retro and vintage, means I have been hunting for an old record player. Then a few years ago, while at a family friends fathers house, we where relaxing in the garden while the children played. 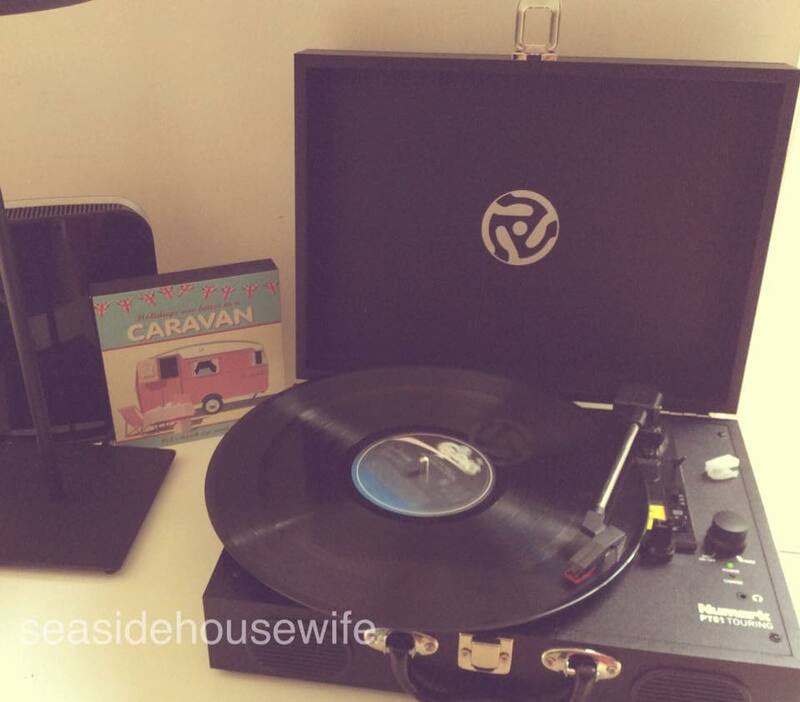 A little cracking noise started and he had got out a wind-up record player! He even put on an Ink Spots record! I have spent hours searching for such a player, hours! They have all been crazy expensive or broken. So I started looking into new 'vintage' style suitcase types. I must say that I wasn't sold on them. They just didn't really compare too the proper original wind-up ones. Having said that, they started to grow on me. Nothing compares to the sound from a record, it's so calming and real. I love the idea of sitting around a campfire, with the crackle of an Ink Spots tune playing in the background-heaven! This is where I got annoyed, I would search the word 'portable.' To me that means, battery, not mains. No, read the small print, many of these suitcase style do not come with an in built battery! They still state they are portable but not for a picnic or beach day! I've read lots of reviews, spent a few weeks looking into it as they do differ hugely in price. All our pennies went on doing Daisy up, so I have to be mindful what I buy for her as we still have lots of work to do! Then I spotted this one made by Numark. I did get quite excited! There are so many makes of suitcase record players, so many unknown/never heard of before, makes! 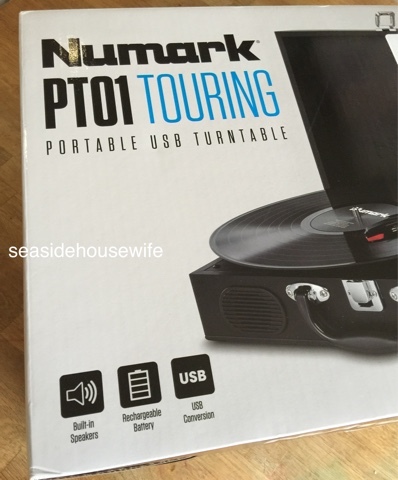 Numark, is the make of my very first set of decks (record players) and they where great! It's a name I trust, so I was excited to see they had made a portable version! The price was about the same as others I have seen on the market and the description said it does come with battery! Was a bit shocked it was not packaged but just posted like this! But it was unharmed. It was like Christmas when this box arrived!! I was so excited to hear my records again, after years. Not much beats the real sound of vinyl. 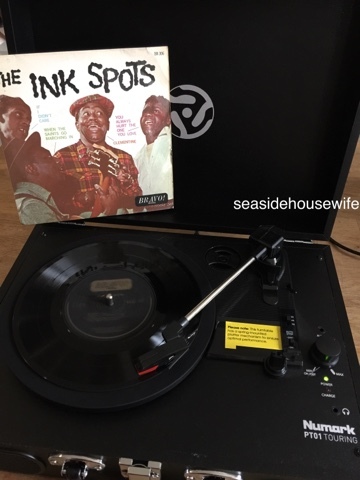 One of my favs groups is Ink Spots and I did spend the whole night sorting through my dusty old records. This is just the pile to bin. Most of mine dated from about 2000, and my taste has very much changed. Though there was still a larger pile to keep, compete with classics from 40's 50, 60, 70 and 80's! I had a huge smile on my face for at least 24 hours and did do quite a bit of dancing around the sitting room! It's so nice to flick through records, looking at the covers. 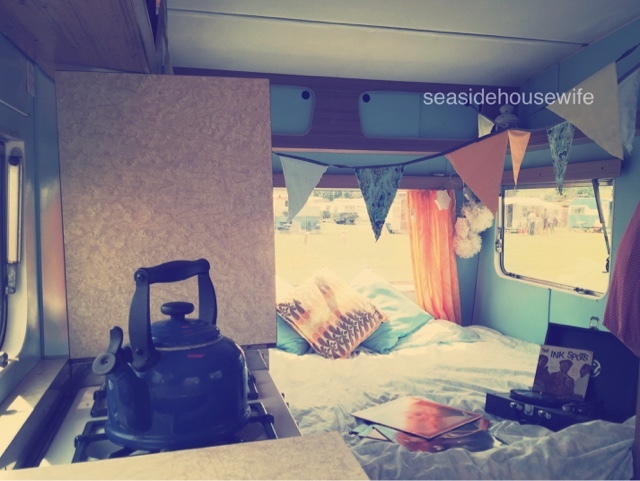 Not only fab to use when away camping, it also looks great as a 'prop' when we show Daisy. I say prop, all the things we use to dress Daisy for a show, are things we use when we are away in her! 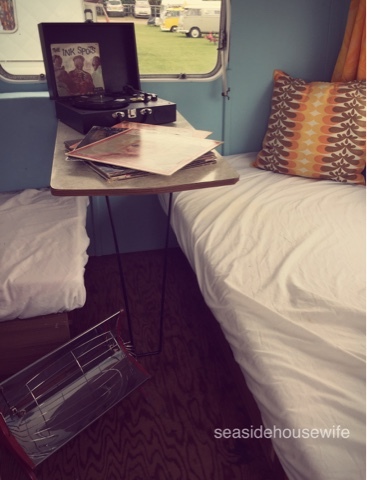 So after using the record player around the campfire in the evening, on the campsite to bring it along for the show. I was really disappointed with my self for not making sure it was in the off position! 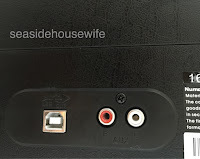 One thing I've noticed is, I think I need to buy a cable separately, to be able to plug in the iPhone/iPod. I really like the intimate sound that the suitcase produces. Perfect for sitting out in the garden in the evening or out for a picnic. For such a little portable case it has just the right amount of sound. 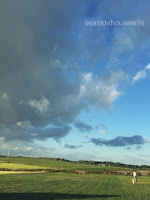 Its quite directional as well, so if your sitting in front of it, its perfect but behind its not still as loud so perfect for inside the caravan or out on a picnic. We have a home surround system and it was easy to plug in the PT01. The sound quality is really good, keep in mind that the current record am playing is 30+ years old. It sounds perfect, the children and I, are having a dance around the living room! The odd crackle adds to the extra depth of sound from these old records. I like the auto stop and the bar to lift off the arm. It has three speeds, 33, 45 and 78. So even though its little and portable they have still thought about little touches, like the little round thing to play records from a jukebox! Our home sound sound system had the red and white matching cables, so I plugged it straight it! 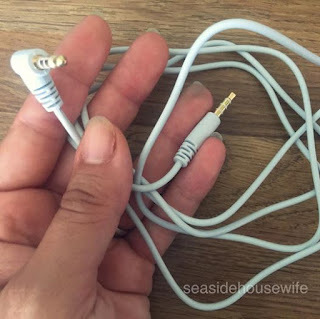 So easy to hook up and use. 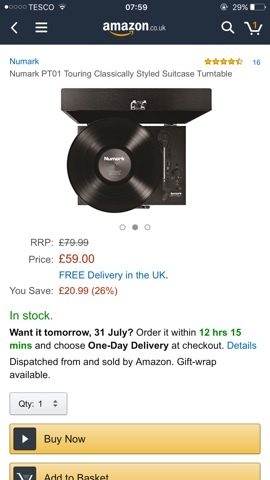 I think they have nailed this, not only great for home use but grab a few records and head out for an adventure! Ok, so your not going to learn to mix with this little case, but it would still be really handy for checking out what tunes your buying! The last two times I've gone to test out the battery power, I had left it in the on position! So make sure, even though the record as stopped, doesn't mean that the power is off! This is the type of cable which will attach your phone/tablet/ipad etc into the player. There is something really magical about records, I have a few of my mothers. While they turn and we dance about to them or sit quietly listening to the crackles. My mind wonders about when they where last heard or my mother sitting their doing the same thing 40+ years ago. Records are so lovely to hand down and there's something really special about someone's record collection. It's easy to put a playlist on and forget about it, the music becoming the background. The difference with vinyl, is its more interactive. You sit and take your time flicking through the artwork. Place the needle down carefully on the record, making sure you don't skip half way through the song! Then the crackles start.....filling the room or space with little crackles of sound as the record spins onto the track. I love that music is the background to my life. Though I do love taking a moment to really appreciate taking a time to pick out a record, sit back and listen to the extra depth of sound. We tested the PT01 out last night, left it unplugged and went through the records. It was great to get on with our evening without the tv on, but chatting about which records we wanted to keep and which to swop out. Am sure it lasted around 4hrs on the battery. Am really happy with this little portable player! It's perfect for what we want and meets our needs! Click above for my video unboxing and review! I have not been paid to write this review, or received anything from Numark. My views are my own! So I have been using and loving my little suit case player for a some months now. We have banned TV in the week for our minis (I will blog about this soon) so when they are all getting a little much or just for some background - on goes our little record player. Well, the speed started to slow down, am not sure when, but soon as I noticed it, it bugged the heck out of me!! Just a tiny bit to slow.....Bugged is an understated, it drove me a little crazy. My first step was to contact Numark and ask what I do about it before I go crazy! They replied with a USA telephone number........Mmmmm. It was about that point I thought about contacting Amazon. Then I did after a few emails/messages, get a reply from Numark to contact where I brought it from....So I emailed Amazon. Wow!! Straight away I received an email, letting me know a replacement was on its way and a link to print a return label for my old one. Such a nice friendly email, and no having to keep explaining the problem. Am impressed!! Thank you Amazon! Good review. I am thinking of getting this!